History of Grand Prix Motor Racing was a long story. Grand Prix motor racing has its roots in organised automobile racing that began in France as far back as 1894. It quickly evolved from a simple road race from one town to the next, to endurance tests for car and driver. Innovation and the drive of competition soon saw speeds exceeding 100 miles per hour (160 km/h), but because the races were held on open roads there were frequent accidents with the resulting fatalities of both drivers and spectators. 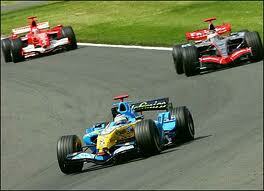 Grand Prix motor racing eventually evolved into formula racing, and Formula One can be seen as its direct descendant. Each event of the Formula One World Championships is still called a Grand Prix. Formula One is still referred to as Grand Prix racing. Marcel Renault during the 1903 Paris Madrid trial. Motor racing was started in France, as a direct result of the enthusiasm with which the French public embraced the motor car. Manufacturers were enthusiastic due to the possibility of using motor racing as a shop window for their cars. The first motor race took place on July 22, 1894 and was organised by Le Petit Journal, a Parisian newspaper. It was run over the eighty mile (128 km) distance between Paris and Rouen. The race started from Porte Maillot and went through the Bois de Boulogne. Count Jules-Albert de Dion was first into Rouen after 6 hours and 48 minutes at an average speed of 19km/h. He finished 3’30” ahead of Georges Lemaître (Peugeot), followed by Doriot (Peugeot) at 16’30”, René Panhard (Panhard) at 33’30’’ and Émile Levassor (Panhard) at 55’30”. The official winners were Peugeot and Panhard as cars were judged on their speed, handling and safety characteristics, and De Dion's steam car needed a stoker which the judges deemed this outside of their objectives. In 1900, James Gordon Bennett, Jr., the owner of the New York Herald newspaper and the International Herald Tribune, established the Gordon Bennett Cup. He hoped that the creation of an international event would drive automobile manufacturers to improve their cars. Each country was allowed to enter up to three cars, which had to be fully built in the country that they represented and entered by that country's automotive governing body. International racing colours were established in this event. In the United States, William Kissam Vanderbilt II launched the Vanderbilt Cup at Long Island, New York in 1904. The first event to carry the name Grand Prix was the Pau Grand Prix in 1901, although this race was a one-off and the term Grand Prix was not in wide usage at the time. The only race at the time to regularly carry the name Grand Prix was organised by the Automobile Club de France (ACF), of which the first took place in 1906. The circuit used, which was based in Le Mans, was roughly triangular in shape, each lap covering 105 kilometres (65 miles). Six laps were to run each day, and each lap took approximately an hour using the relatively primitive cars of the day. The driving force behind the decision to race on a circuit - as opposed to racing on ordinary roads from town to town - was the Paris to Madrid road race of 1903. During this race a number of people, both drivers and pedestrians - including Marcel Renault - were killed and the race was stopped by the French authorities at Bordeaux. Further road based events were banned. From the 32 entries representing 12 different automobile manufacturers, at the 1906 event, the Hungarian-born Ferenc Szisz (1873–1944) won the 1,260 km (780 mi) race in a Renault. 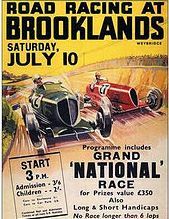 This race was regarded as the first Grand Épreuve, which meant "great trial" and the term was used from then on to denote up to the eight most important events of the year. Races in this period were heavily nationalistic affairs, with a few countries setting up races of their own, but no formal championship tying them together. The rules varied from country to country and race to race, and typically centered around maximum (not minimum) weights in an effort to limit power by limiting engine size indirectly (10–15 L engines were quite common, usually with no more than four cylinders, and producing less than 50 hp). The cars all had mechanics on board as well as the driver, and no one was allowed to work on the cars during the race except for these two. A key factor to Renault winning this first Grand Prix was held to be the detachable wheel rims (developed by Michelin), which allowed tire changes to occur without having to lever the tire and tube off and back on the rim. Given the state of the roads, such repairs were frequent. In 1946, following World War II, only four races of Grand Prix calibre were held. Rules for a Grand Prix World Championship had been laid out before World War II, but it took several years afterward until 1947 when the old AIACR reorganised itself as the Fédération Internationale de l'Automobile or "FIA" for short. Headquartered in Paris, at the end of the 1949 season it announced that for 1950 they would be linking several national Grands Prix to create Formula One with a World Championship for drivers, although due to economic difficulties the years 1952 and 1953 were actually competed in Formula Two cars. A points system was established and a total of seven races were granted championship status including the Indianapolis 500. The first World Championship race was held on 13 May at Silverstone in the United Kingdom. The Italians once again did well in these early World Championship races, both manufacturers and drivers. The first World Champion was Giuseppe Farina, driving an Alfa Romeo. Ferrari appeared at the second World Championship race, in Monaco, and has the distinction of being the only manufacturer to compete throughout the entire history of the World Championship, still competing in 2011.